And that’s only scratching the surface. The Jeep Wrangler exterior is home to a wealth of features deeply envied by more pedestrian SUVs. Maintains classic Jeep Wrangler style, with available LED headlamps to illuminate the path ahead with clear, white light. BF Goodrich All-Terrain K02 tires, to be exact. They’re uniquely designed to handle almost any kind of surface regardless of weather condition. The perfect option for dealing with colder climates, heated exterior mirrors clear ice and condensation for flawless visibility all year round. Choose from a diverse selection of available Mopar® accessories, including suspension lift kits, bumpers, winches, rock rails, differential guards and off-road light kits. One of the Jeep Wrangler coveted exterior touches is the Trail Rated® badge, which signifies is superior off-road ability in terms of traction, ground clearance, maneuverability, articulation, and water fording. Multiple door and roof options allow exterior setup to be as versatile as your drive including Standard Sunrider® Soft Top, Available Modular Freedom Top® Hardtop, and Available Removable Half-Frame Doors. 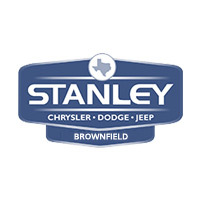 To take a closer look at the Jeep Wrangler exterior or talk with our finance team, visit Stanley CDJR Brownfield today – alternatively, feel free to contact us directly.